And so July rolls around to August, so it’s time for our July newsletter! I think we can best surmise July for us using various clichéd yet accurate adjectives such as “busy”, “stressful”, “productive” and “challenging”. 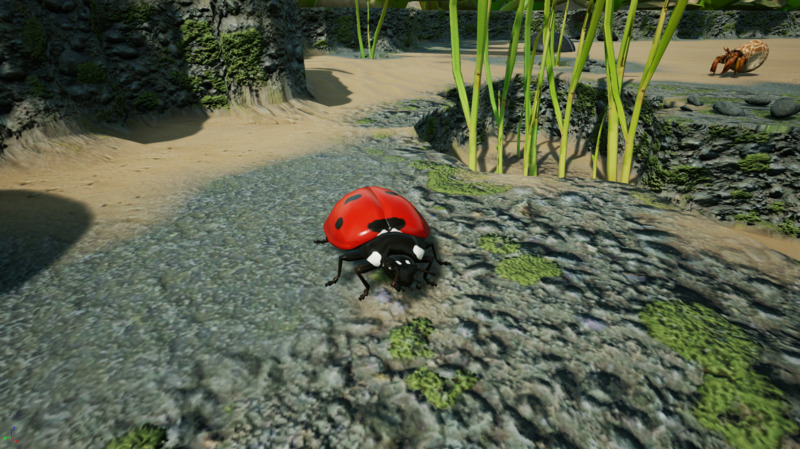 As we approach something close to an announcement time we’ve weeded out various long-standing issues, delved deeper into the Unreal Engine 4 code than we ever intended to, and animated a ladybird. Pretty standard for us. Ladybirds, or ladybugs depending on your parlance, are of course famously insectivorous beetles that love an aphid or two. One of our Kickstarter backers – Maggie – requested they be added to the game as part of her reward tier so here they are! In our game, you’ll be able to harvest honeydew from aphids but your capacity to do so can be severely diminished by the ladybirds. Check out the GIF below – a beetle flies into the scene off-camera, walks over to the aphids, takes one to eat then flies off. They’ll needed to be fiercely contested on some maps to ensure your colony has an ample food supply. Something that took us somewhat by surprise is the popularity of the arachnids that will be featuring in our game. When we started posting pictures and videos of the finished models we decided to add an arachnophobia warning to the posts, since we know that is an issue for some people. We’ve relaxed on this over time since we figured by now people pretty much know what to expect from us, but we still decided to warn people about Segestria florentina, a European funnel web spider. Everything about her screams menace, and our animator Matt has once again done an incredible job of bringing this fearsome spider to EotU. We can’t wait to show you her lair – she sits at the entrance to a tunnel made of her own webbing, which is attached to long tripwires which allow her to sense the slightest movement. If an ant strays too close, it’s lights out for them. Watch her animation set in the GIF below. Some species of ant specialize in conducting raids on neighboring colonies to take their unhatched young. Most of the stolen pupae and larvae are eaten, but a few of them are raised as new workers and soldiers for their captive colony, hence the name of slave-makers. 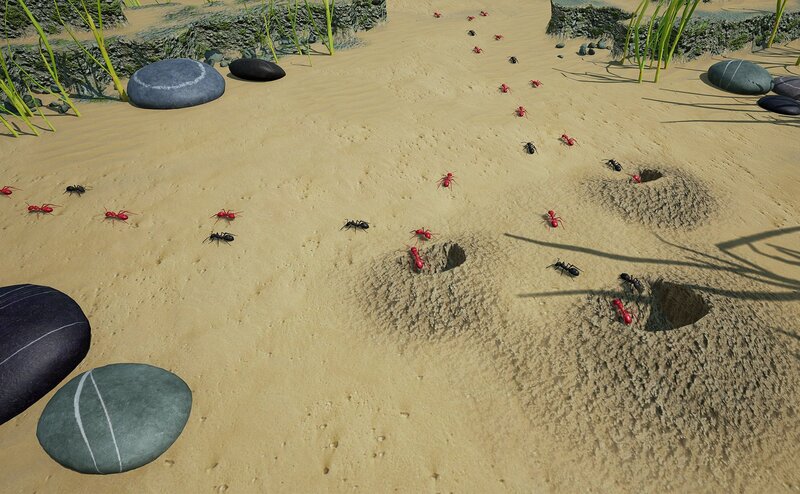 In one of the early access levels, your ants will encounter a colony of Formica sanguinea, otherwise known as blood-red ants. When they take your young from their nursery tiles, that tile will become unusable for a significant amount of time – so unless the slave-makers are dealt with soundly you’re going to find yourself outnumbered very quickly. Woodlice are likely familiar to practically everyone who’s ever looked under a dead log in their garden. They’re isopod crustaceans that feed mainly on decaying plant matter. In nature, they’re too tough for most ants to take down. We still want our in-game ants to be aggressive, so to represent the innate toughness of the armor-covered woodlouse, we’ve given it a “bunker down” ability as you can see in the GIF below. When it enters this mode, the woodlouse takes significantly less physical damage. A tricky critter to take down. Our composer and sound designer Liam has been working through some challenging technical difficulties to get his dynamic music system working. The issue he was having was to do with the timing of new clips starting or ending, which because of the way the engine works could sometimes be a beat out of sync and therefore sound wrong to the ear. He believes he’s now solved this issue with some workarounds and redesigns, and has now got back to the task of finishing up the music needed for early access. Liam has also started the task of getting the voice of the narrator – played superbly by the talented Callum Edmunds – into the levels. He’ll speak as the levels progress, commenting on the evolving tale of your ants, and introducing new creatures the colony encounters. He’ll also provide some more traditional RTS commentary, such as informing you when your queen is under attack or when your ants see an enemy. John is furrowing his brow regularly as he works to complete the six levels required for early access. One particularly ambitious level (known internally as “2.1”) is keeping him up late as he works to include all of the planned events and timings. With such a small team (3 developers and 1 social media guy), the issue of balance is obviously very difficult when we’re in the developments stage. This is why our beta before the main early access starts will be so vital – we have in the region of 900 people who bought into the beta tier on Kickstarter or Paypal, which should give us a large enough player base to get significant feedback for the numbers we need to tweak. Obviously we will continue to balance and change things after early access starts – so if you’re planning on giving the game a spin later this summer now would be the perfect time to get registered on our forums and introduce yourself to the small but passionate community of ant fans already talking about the game there. As John completes the preliminary designs for the levels, he hands them over to Matt for an art pass. This means that all the pebbles, plants, and intricate texturing gets added after the layout and scripted features of a level are done. We hope to have all of the levels playing and looking nice in time for early access to start, but as mentioned feedback on all of these points will be very much appreciated. Happy Christmas Eve! I thought we should chat about this most festive of topics, the move to a pre-built engine. TLDR: Kickstarter showed that PC is the most popular platform for the game so we are focusing on that. We need not be as efficient with our programming for PC and a pre-built engine allows us to give prototypes to the community so they can help in development. Unreal Engine 4 (UE4) has some great features that will help us more rapidly move forward with the project. Why so quiet? Dev Update! Yes we have been unusually quiet this past week. We will try and post things but there will be a little lull until the last week of the month. But do not fear it is not because we are not doing anything… in fact it is the opposite we are working harder than ever! Reason being we are attending EGX on the 24th and 25th and so we are getting together a game build and preparing promotional material. By the moths end there should be much more available here for you to sink your teeth in to, and in the following month the main site will get an update as well! Hope those English amongst us had a good bank holiday, I know we did. Just a brief one to let you know how it is going. The weekly dev update has arrived! Hello everybody! Quick dev update here. So in the past week Liam has been sinking his teeth into the code. He has been exploring ant positioning and calculating ways to spread the ants out often to hilarious outcome. He assures me he has improved it since, but below is one of his early formation algorithms. Joy!